A major challenge with Weed Man’s previous website had been maintaining brand consistency in local markets–particularly with regard to messaging and creative assets. The site was not built with the franchisee end user in mind and was proving ineffective at catering to the regional variations of the business across the country. A number of goals were identified, including: intuitive content management capabilities for franchisees with consolidation for those who own multiple locations, improved SEO, continued increases in lead generation and conversion, consistent design quality and strategic thinking across all marketing channels, unparalleled customer support to all Weed Man Canada stakeholders and new enhancements to nurture the customer buying process. 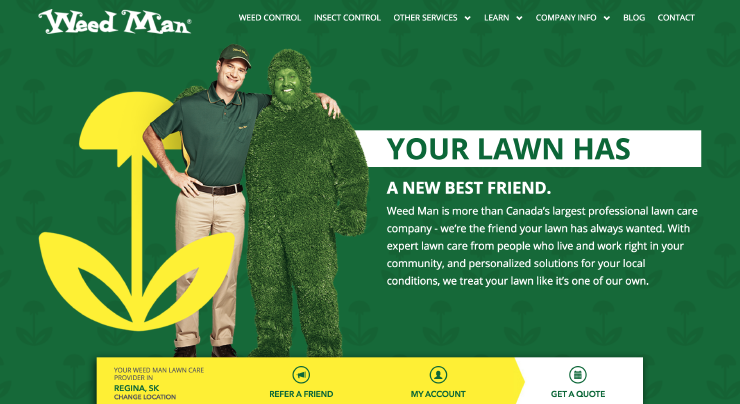 A robust plan was put into place to tackle the site rebuild, which resulted in the delivery of a fully responsive brand new consumer-facing website for Weed Man Canada including national (corporate) content, as well as customized local content for each franchisee. The website includes a fully functional lead generation form, an email support system (including automated emails to new customers and notifications to franchisees about new leads), geographic location technology that recognizes a website user’s location and directs them to the appropriate local page, blog and social integrations, and customized content for national and local marketing campaigns (such as promotions and special offers). As well, the site is SEO optimized to its highest potential. The agency also delivered a new back-end franchisee interface that allows local dealers to edit and manage content on their website and have access to real-time analytics and results related to their campaign.